Are you looking to get started with web animation? Awesome! 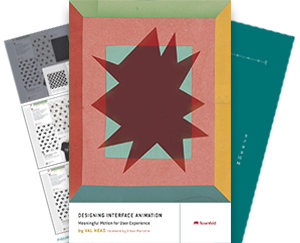 Here are some of my favourite resources for learning about web animation and designing interface animations. For a fresh blast of web animation advice, resources and inspiration every week, join The UI Animation Newsletter. I also teach web animation workshops for events and companies. Email me to set up a web animation workshop for your event. What Are Your Transitions Saying? A little video and a collection of .gifs about the 12 traditional animation principles that are still relevant in our work today. Based on The Illustion of Life book. Yes, an entire book about timing. Lots of good stuff in here! A library of transitional interface and interaction design patterns. Video snippets of UI animations on screen. Sometimes it gets really shaky, but there is a good variety of exmamples. Yeah, I know it’s not UI, but title design can be some great inspiration. This one focuses on native apps and shows multiple interactions for most apps which is great. A tool for creating and editing complex matrix transform keyframe animations. A million times easier than writing out the matrix transforms yourself! Helpful performance tips for specific CSS properties. Don’t bother trying to remember which properties cause paints or don’t. Just look it up here! The four CSS properties browsers can animate cheaply plus a primer on what Dev Tools is trying to tell you about your animation performance. How to do parallax if you must do parallax or if you have a really good reason for doing parallax. Some may call it overkill or old school, but here’s the thing – if it works for you, use it! And if you’re curious about using it for UI work, this short tutorial will get you started. Love their timeline metaphors! Love the fact that it keeps us in the browser for appropriate context! But for the love of kittens everywhere, never use the code it spits out in production please. Web animation is still in it’s infancy in the grand scheme of things. There are so many more places for us to go! The Web Animation Spec might just get us there? Motion paths in CSS? That could be pretty darn useful, huh? A very helpful series by Dan Wilson on how the Web Animation API works. The official word on what is and isn’t part of the spec for the Web Animation API.